CBD advocates, medical marijuana supporters, recreational users – anybody who’s using or is interested in cannabis, whether for medicinal or recreational purposes, has likely heard of Rick Simpson Oil. But how much do you know about Rick Simpson Oil, really? And, more importantly, where can you get this cannabis oil? Rick Simpson isn’t a doctor. As far as we know, he doesn’t have any medical background nor was he using or working with cannabis for a good portion of his life. He was an engineer working in a hospital in Nova Scotia. It was a work-related accident that got him started on using medical cannabis. He was working with boiler pipes one day in 1997, covering asbestos with duct tape and aerosol glue, when the fumes made him pass out. He fell off a ladder and hit his head. Rescue didn’t come immediately. Nobody knew he was injured! When he came to, he had to stagger back to his office, his head pounding from a massive headache. It was there that a coworker found him and got him the help he badly needed. The head injury he sustained from his fall was made worse by the toxic fumes he inhaled. And the medications his doctors gave him didn’t help to alleviate his symptoms. Instead, they only gave him horrible side effects. In late 1998, he saw a documentary about the medicinal benefits of cannabis, and it got him interested in trying it out. So he did, and to his surprise, smoking cannabis helped his symptoms more than the prescription drugs ever did! Curious to explore the possibilities of medical cannabis and to use it for his symptoms, he asked many doctors, including his family doctor, how he could legally acquire cannabis. But they refused to help him, saying it will not do him any good and that it will only damage his lungs. But Rick’s family doctor, when asked if just the oils of the cannabis plant could be ingested orally as opposed to smoked, agreed that this would be the more medicinal way to use cannabis. So Rick Simpson took matters into his own hands, did his own research, and made his own cannabis oil. Surprisingly, his cannabis oil did what his prescription medications weren’t able to do – it made him better. Not just “feel better,” but it cured the symptoms he had after his accident, even the side effects from all the medications he was taking! Flash forward to late 2002. Rick received one of the worst news anybody could get. Rick was diagnosed with Basal cell carcinoma. He had three lumps on his body – one on his chest, one near his right eyebrow, and one on his left check. His doctor excised one of the lesions in early 2003, but a few days later, the excised lesion got infected. It was raw and painful. And here at Rick’s lowest point did that cannabis documentary he saw many years ago suddenly pop back into his mind. Rick placed a few drops of his cannabis oil on Band-Aids and covered the lesions with them. Four days of using his oil for his lesions and they were gone. Completely and absolutely gone! Excited, he shared his findings with his doctor who, unfortunately, wanted nothing to do with it. This didn’t stop Rick Simpson from sharing his knowledge about medical cannabis. It didn’t stop him from sharing his oil with his friends, family, and anybody who needed it. Instead, it started him on his journey as a medical cannabis advocate. He grew his own plants, harvested them, and made his precious oils himself. Rick Simpson has been called a drug pusher for giving away his “weed oil.” But this didn’t stop him from helping people, nor did the numerous raids the police did on his property. If you haven’t watched the documentary about Rick Simpson called “Run from the Cure,” go watch it now[i]. Never has a documentary made me feel so many different emotions! From helplessness and frustration at the people who paint medical cannabis as a bad plant, joy for all the people who were helped by his oil, belief that the truth about this beautiful plant will reach all, and hope that someday those against it will finally have their minds and hearts opened. It wasn’t Rick Simpson himself who named his oil “Rick Simpson Oil”, but someone who believed in the work Rick was doing. That man was Jack Herer, one of the leaders and advocates of the hemp movement. Jack Herer is the author of the famous book, The Emperor Wears No Clothes. Rick Simpson Oil, compared to CBD oil, is a cannabis oil made from THC dominant marijuana plants. It contains a high amount of THC at about 90% or more[ii] with only a small percentage of CBD. Because it is a full-spectrum plant extract, Rick Simpson Oil also contains other types of cannabinoids like CBN and CBG. CBD oil, on the other hand, has more CBD content and only a minute level of THC. Full spectrum CBD oil is made from CBD dominant marijuana or CBD-rich, high-resin hemp plants. Rick Simpson Oil and CBD oil are similar in that they are from the same plant family — cannabis. But here, their similarities end since they come from two different cannabis varieties. Rick Simpson Oil is made from cannabis strains which are THC dominant marijuana strains. These strains contain a lot more THC than CBD. 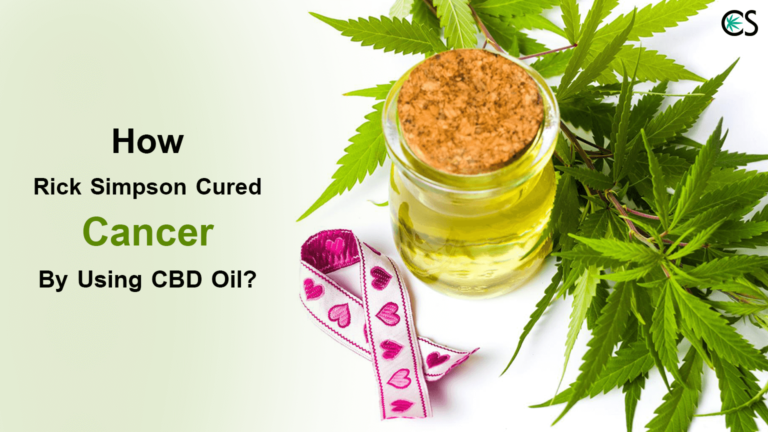 CBD hemp oil and CBD marijuana oil are made from strains of hemp and marijuana that are either CBD dominant (more CBD than THC) or mostly equal in their CBD and THC content. The difference comes down to the amount of THC and CBD, the primary phytocannabinoids found in cannabis plants. Will Rick Simpson Oil get me high? Getting the high, according to him, won’t harm anyone[iii]. In fact, he believes that if you remove this property from his oil, it would reduce the efficacy and healing effects of the oil. But if you can’t tolerate the effects of THC, you can always try CBD hemp oil since it’s non-psychoactive and offers many similar benefits as Rick Simpson oil. Notice that we said CBD hemp oil. A CBD oil made from marijuana may have equal parts CBD to THC, or far more THC than a CBD hemp oil. And it’s true that if a cannabis oil contains equal parts CBD to THC, the CBD may decrease the psychoactive properties of THC (one of the unique properties of CBD is that it decreases the high of THC). But that doesn’t mean you might not feel some psychoactive effects from a cannabis oil made from marijuana which contains a significant amount of THC. You can only figure this out by trying out different oils. The only CBD oil which is nonintoxicating is CBD hemp oil because CBD hemp oil will not contain more than 0.3% THC – a very small amount of THC. What is Rick Simpson Oil used for? Cannabis oil, including Rick Simpson Oil, has the potential to help with the symptoms of various medical conditions – from cancers, chronic pain, infections, migraines, and mental health issues. And if you read through all the research studies[iv] done on the health benefits of cannabis, you will find that medical cannabis really has significant potential to help people. Does Rick Simpson Oil really cure cancer? Well, Rick Simpson had skin cancer, and his oil helped him. His oil was also able to help a lung cancer patient and a terminally-ill cancer patient who was given only two months to live. There are more people his oil has helped, and you can learn more about these patients from the film, Run from the Cure[v]. This is all anecdotal evidence. We cannot verify the truth of these cases or the current status of these patients. Numerous research studies show that medical cannabis has the potential to fight cancer cells[vi], prevent them from growing and spreading, and even prevent blood vessels from growing on them and providing them the nutrients they need to grow and metastasize. Is Rick Simpson Oil really free? The oils Rick Simpson originally made were free, and he gave them to anybody who needed his help at no cost. They are NOT the original Rick Simpson Oil. Rick Simpson doesn’t have any representative in any country making and distributing the oils for him. Rick Simpson isn’t associated with any organization or foundation claiming to have some connection with him. His one and only official website is phoenixtears.ca. You can go there to learn more about him and his oil. The legality of Rick Simpson Oil is the same as any other THC containing cannabis product. It is illegal to make this oil in many states because of its high THC content, so it may be very difficult for you to get Rick Simpson Oil or any other THC product, depending on where you live. Where can I get Rick Simpson Oil? 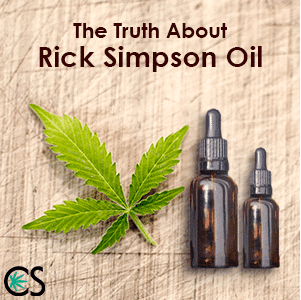 There is no way for you to obtain the original Rick Simpson Oil from the man himself, so the best that you can do is to produce your own RSO oil. I won’t post the “recipe” here, but the information is available online on his website. To be safe, only use the “recipe” Rick Simpson posted. And please follow his instructions carefully. This is important. You need to follow the instructions carefully so that you don’t make an oil with toxins left in it from the extraction process. You don’t want the oil you make to harm you instead of help you. A warning before you start: know the cannabis grower you will be sourcing your raw plant material from. Read, research, ask around, look for credentials, ask for references, ask for customer feedback. It’s important that you ask questions. A trustworthy grower will answer all your questions without any hesitations and trepidations. Remember: cannabis is still a new and highly unregulated industry. The responsibility is on YOU to buy or make the safest product for yourself. Always insist on finding out as much as you can about the products you are buying. The benefit of buying cannabis oil over making it yourself is that if you find a reputable company, you can be confident that they are producing your oil in a clean lab and then also providing you lab test results to prove the quality of your product. If you decide to make your own oil, the best you can do is get the oil tested before you use it. If you decide to make Rick Simpson Oil, follow Rick’s instructions carefully. How do you use Rick Simpson Oil? Before you use Rick Simpson Oil, it’s important that you consult with your primary care physician first. Rick Simpson Oil can be ingested or applied topically[ix] on your skin. The Rick Simpson Oil dosage will depend on your medical condition. If you find the taste of Rick Simpson Oil not to your liking, you can always mix it with a little piece of bread or put it on a cracker. You can even place it between slices of your favorite fruits! What follows is not medical advice. According to Rick Simpson’s website, you can use the oil for as long as you’re suffering from your medical condition. But when you’re feeling better (and when your lab tests show it), you can still continue to use the oil but then you may reduce your dosage down to a maintenance dose of about a gram to two monthly[x]. It’s up to you, really, since you have control over your dosages. What are the possible side effects of Rick Simpson Oil? Rick Simpson Oil has its side effects[xi], too, in addition to getting high. You may experience drowsiness, so if you do, it’s best that you sleep and rest. After all, sleep and rest are an important part of the healing process. Other side effects include unsteadiness and poor concentration. All these side effects tend to go away in less than a month as you develop tolerance to the oil. If you’re going to use Rick Simpson Oil, you may have to have someone drive you around for a while till you get used to the oil and the side effects go away. We recommend that you do not drive when you are using Rick Simpson Oil or any cannabis oil. Should we trust Rick Simpson about his oil curing people? Rick Simpson had skin cancer. He had three lesions on his body – one on his chest, one above his right eyebrow, and one on his left cheek. The lump on his right eyebrow was excised by his doctor. Before the doctor could get to the other two lesions to remove them, the area of the excised lesion got infected. Staring at his infected wound, Rick remembered a report he heard in 1975 that said THC has the potential to kill cancer cells. Knowing that his oil was THC-rich and has already helped his other medical conditions, he decided to give it a try to treat his wound and other lesions. He treated the areas with his cannabis oil. He placed a few drops on some bandages and applied the cannabis oil-bandage over his three lesions. After four days, when he peeled the bandages off, he saw that the lesions were gone. Excited to share his news, he went back to his doctor and asked for his pathology report, which confirmed that, indeed, it was basal cell carcinoma. When he told his doctor about his findings and that his oil cured his skin cancer, his doctor didn’t want anything to do with cannabis. You can read more about Rick’s remarkable story in his book entitled, Phoenix Tears: The Rick Simpson Story. But should we trust his findings? Unfortunately, like many other miraculous stories about cannabis, Rick’s experience is anecdotal evidence. Science has shown us that cannabinoids definitely have anti-cancer properties. And yet, we still can’t say for sure that cannabis oil will cure cancer with absolute certainty. What we can say, is that cannabis might be something you want to consider if you are dealing with cancer. Cannabis has demonstrated the ability to make a cancer patient’s life so much better by helping with pain, nausea, and appetite. Rick Simpson Oil is one man’s recipe of a high THC cannabis oil. It’s one variety of many of the high THC medicinal cannabis oils which are currently being used all around the world. These oils have historically helped many people and with cannabis prohibition finally fading away, are making a major come back in medicine. There are many good reasons to use cannabis oils. Medical cannabis has already helped countless numbers of people, and this is supported by clinical trials and anecdotal stories. But because of legal issues and too few clinical trials on humans, there isn’t enough definitive research and studies that can help us reach conclusive judgments on medical cannabis. However we know cannabis medicine definitely helps many people live better lives and that is very promising. The future of cannabis medicine is bright. Always consult with your doctor before using any form of cannabis products. [i] Rick Simpson Phoenix Tears. November 26, 2014. YouTube, Run from the Cute, Full Version. [ii] Phoenix Tears, FAQ about RSO. [iii] Phoenix Tears, FAQ about RSO. [v] Rick Simpson Phoenix Tears. November 26, 2014. [vii] Phoenix Tears, Message from Rick Simpson. [viii] Phoenix Tears, Message from Rick Simpson. [ix] Phoenix Tears, Dosage Information. [x] Phoenix Tears, Dosage Information. [xi] Phoenix Tears, Dosage Information. [xii] G Velasco, et al. June 10, 2015. 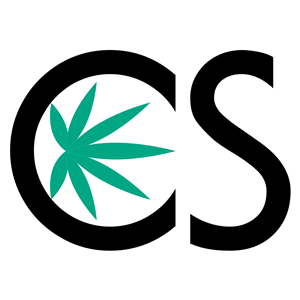 The National Center for Biotechnology Information, The use of cannabinoids as anticancer agents. This is about how Rick Simpson Cure Cancer by using Cannabis oil. Let's explore the Rick Simpson oil! Hi thanks for your comment. What do you mean by big commercial? CBD School is not affiliated with Phoenix Tears.